Ludwig Standards from late 60's or early 70's. I am not able to come up with an exact date. You can't see the full kit, but I'll post the specs below. I also have 2 Tama Steel Mini Timbales (6x4 and 8x4) but I don't have them set up right now. As mentioned before, I'm currently working on my playing skills rather than buying new equipment, but after I've seen adequate improvement in myself I want to upgrade my snare drum. The one I'm looking into is the Pearl Free Floating Maple Snare in 14x6.5. Sometime in the future when I have more room I'd love to add one of Tama's 20" Gong bass drums in as a large second floor tom. I love how those things sound! I'm not sure though because although I intend to keep this drumset forever, I might want to upgrade to a Starclassic Bubinga or something like that someday, and I might just get the Gong drum with that and use my current set as a travel kit or something. I also might get other snare drums for different sounds, but I'm not sure what those others would be at this time. I also have a 16" O-zone effects crash, but I don't have it set up in the video or right now. Also, the second crash in the video was a Pro 18" Studio(?) Crash. I cracked it years ago though and I replaced it last Christmas with the X-plosion crash. As mentioned in the cymbal setup thread, I want to eventually get a third crash (most likely a 15" Paiste Signature Fast Crash) and a second splash (not sure yet which one) as well as upgrade my ride and hi-hat (21" Sabian HH Raw Bell Ride and 13" Sabian AAX X-celerator hats, respectively). I'll probably keep the old hi-hat and ride as extras or something. I currently have a clear Evans hydraulic batter on my 13" tom which is out of commission because I need to get a new starcast tom mount (the current one doesn't have the pads on the mounting part of it and the tom loses resonance when mounted on a stand). I need to get new heads for the mini-tymps when I set them back up and I'm thinking just 1-ply coated heads will do great on those. As far as a gong drum goes, I'm thinking maybe the Evans hydraulic blue would do well on that. I heard a sample of that head on a gong drum on youtube and it sounded awesome. I don't know if I'll ever get a rack mount when I add on a couple more cymbals and drums or if I'll just stick with stands. Either way, though, I want to get rid of the Sound Percussion stand because it's a big bulky one I traded a PDP 800 stand for to one of my friends (big, stupid mistake). The Dixon actually works well despite being a possible knockoff brand. If I get a rack I'm not sure if it'll be a Gibraltar or PDP. I have a crappy throne I had with my first kit like 9 years ago. I'd like to upgrade my pedal to a DW5000 Turbo sometime as well as upgrade my throne to a Roc-n-Soc padded throne with nitro lift. As Monty Python used to say, "And now for something completely different." I performed a full concert on just Gongs/Bells/Singing Bowls/Sound Plates/Cymbals etc. in a beautiful old church yesterday. The sound was wonderful. I played my own compositions and a few improvisations. Much fun despite the hectic set up. New to these forums and wanted to share my drum set with everyone. My drums are a CB Drums/Percussion drum set which I bought as a 5 piece back in June 1995. As you can see I have added on to it since then to include 2 10 inch toms, a 15 inch tom and another 16 inch floor tom. 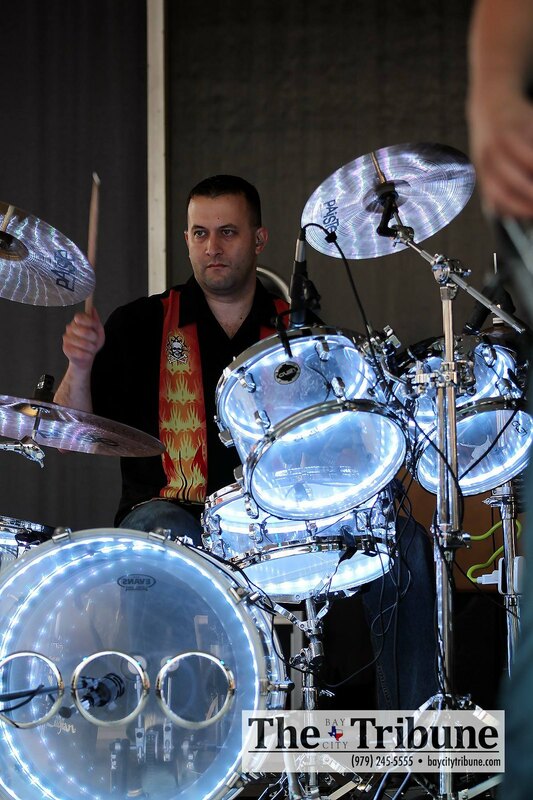 This picture is from 4 years ago but since this picture I'm now using Evans EC2 Coated heads on the toms and Evans G2 on the snare and a coated Evans EMAD on the bass drum and Genera Resonant Clears (Glass) on the resonant heads except for the front (CB Drums logo). I also use Zildjian cymbals with a complete set of Zildjian ZHT's and an assortment of A Zildjians, K Zildjians, A Customs, K Customs and Z Customs with a few ZBT's thrown in. Here it is from the front. Here's the full view of the drums. Hit me with rhythm, there is no pain. Current set up of my Granstars, snare is a Chad Smith, new cymbals are Paiste Full dark signature 20" ride, K Custom hybrid 18 crash, Sabian el-sabor splash, nice Paiste Twenty 18" china (not shown), K hihats ...loving them. Like many others here, I'm sure, I'll use different setups for different performance situations. To minimize my self-indulgent tendencies, I'll keep this to two: one from a symphony "pops" concert a few years ago, and another from a steel band gig earlier this year. 12” tom, 10” tom, 16” floor, 22” kick. It's been a while. My main kit for gigging this summer. A 1969ish Slingerland, Skyblue Pearl, 13, 14, 16 and 20. Rogers COB Dynasonic snare, and a nice mix of Mehmet, Agop, and Bosphorus Cymbals. Better Pics as the summer progresses. Enjoy! B. Bob, what cymbal stands are those? I'm not Bob, but I believe those are Axis cymbal stands. Very cool design. They are indeed Axis stands. I bought them maybe 15 years ago. Very light weight, very sturdy. I use 5 cymbal stands and a hihat stand. Just modified the cymbal sleeve to accept a Tama cymbal lock. I gig them regularly. One of the best investments I ever made! I took part in a fun concert this past weekend, commemorating the 25th year of the community music school where I teach drums and piano. One kit was for a piano trio, and the old Leedy kit was for an arrangement of Louis Armstrong's "West End Blues." Alas, that's not my rug. Very nice, James ... thanks for sharing! Love the Leedy kit.